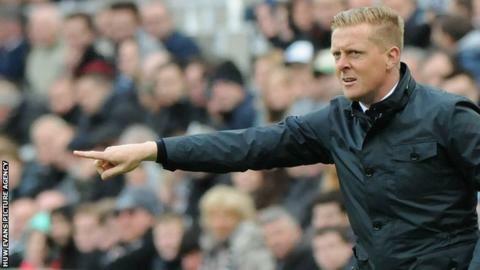 Swansea City have started talks with manager Garry Monk about extending his contract BBC Wales Sport has learned. Monk, 36, has two years left on his current deal at the Liberty Stadium. He has impressed in his first full season in charge leading the Swans nine points above their previous best Premier League points total with two games to go. Monk has been linked to West Ham and the Swans are keen to reward Monk for the job he has done. The Swans moved to within a point of seventh-placed Southampton after their 1-0 win over Arsenal at the Emirates on Monday and are on course to finish higher than their best ever Premier League finish of ninth in 2012-13. Finishing the season seventh could earn qualification to Europe's second-tier tournament if the Gunners beat Aston Villa in the FA Cup final. Meanwhile Swans defender Angel Rangel is due to have a scan on a groin injury which forced him off in the second half of Swansea's win at Arsenal. Swansea complete their home campaign against Manchester City on Sunday 17 May before finishing the season away to Crystal Palace a week later. Swans defender Angel Rangel is due to have a scan on a groin injury which forced him off in the second half of Swansea's victory at Arsenal.